Time for transparency – not more perversity! In last Thursday’s edition of the Leatherhead Advertiser (19th Sept.) we had the now well-established arguments for and against the Longshot development of the Chirkley estate rehearsed yet again. Once again Longshot trotted out their “leading planning QC, Christopher Katkowski,” claiming the Judge had reached a flawed decision. If you have not yet read Justice Haddon-Cave’s judgment, click here. Also worth reading is this UK Human Rights Blog article. Justice Haddon-Cave refused MVDC and Longshot leave to appeal because, in his opinion, any appeal was doomed to fail. The planning specialist barrister and the planning law consultant named above clearly think Justice Haddon-Cave gave a sound and correct judgment. So why, therefore, is MVDC asking the Court of Appeal leave to appeal against the judgment.? Why are MVDC officers once again being asked to defend a decision that went against their recommendations? Who took this decision to apply to appeal against the judgment? Why cannot the residents of Mole Valley be given the wording of the external legal advice upon which it is taking this step? There has been enough perversity about this matter. It is high time we had transparency! Please read this email I have recently received from Dr Patricia Wiltshire which I quote below with her permission. Look at the video clip and and consider her last paragraph very carefully. If you are sympathetic to the fate of the landscape around you, please forward this message to as many of your contacts as possible. I am sure that many are aware of the changes wrought at Cherkley Court by developers, Longshott. The planning team at Mole Valley District Council advised the Council to refuse planning permission for the construction of a golf course on the land, which is in an area of outstanding beauty, and has stunning views. There were many reasons for objecting to the development, but one major one was because the proposed golf course would destroy vast areas of chalk grassland which is rare ecosystem, both in national, and global terms. Furthermore, the proposed golf course would be virtually contiguous with an existing one, and there is a large number of courses in Surrey already. 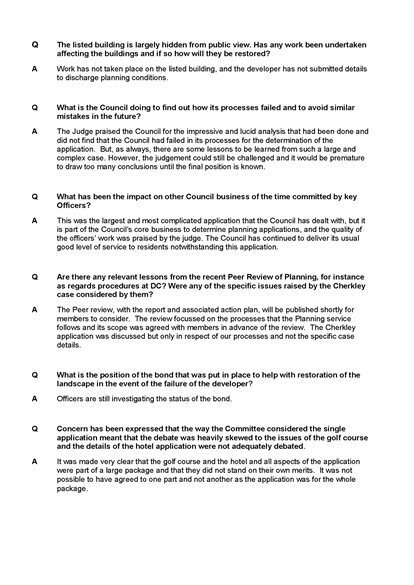 Longshott failed to demonstrate a need for another golf course in Surrey, and it was considered that local people were unlikely to gain sufficient benefit from its construction. The new course would only be available to the select few who could afford very high membership fees. The Council ignored the advice of their own planning department and gave permission for the development. Developers have destroyed a huge area of grassland. Have a look at the short video (link below). 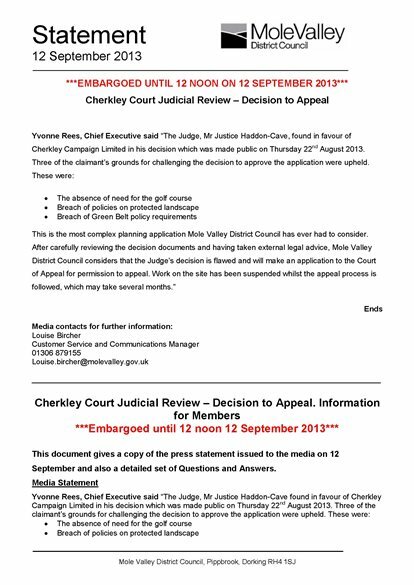 The Cherkley Campaign applied for a judicial review, and the judge ruled in their favour. He found that the decision to allow development was flawed. He denied Longshott the right to appeal against his decision. 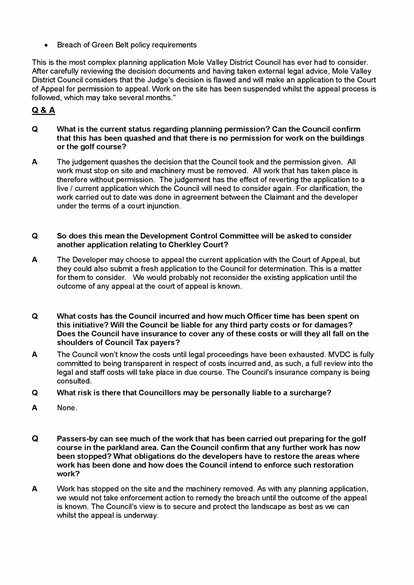 However, not only are they putting together an application for an appeal, the Chief Executive of Mole Valley District Council has announced that MVDC will also appeal against the decision (see attachments). One must ask whether it is morally acceptable for MDVC to mount an appeal in favour of a planning application from an independent developer when its own planning department advised against it, and a judicial review has also found the decision to be unsound. Whether you care about the chalk grassland or not, one must also ask whether it is right for MVDC to use tax payers’ money to do this. So MVDC want to see this part of the Green Belt developed for the use of an exclusive few, and has recently expressed the desire to sacrifice Green Belt adjoining north Leatherhead to a housing developer. I find it difficult to believe that the Green Belt is safe under the current regime in the Mole Valley! Please click here for the full newsletter – which has links to all the concerts mentioned. September’s here and there is plenty of music planned for this Autumn, including this week’s Music on Thursdays 12.30 lunchtime concert at Leatherhead Methodist Church. ACACIA Flute and Harp Duo bring MoT our first harp performances. Their lovely programme is on this link. Working in the City ? Soprano Alice Bishop has delighted MoT audiences and can be heard in a lunchtime concert at Holborn Viaduct this Friday. Full info here. Spectacles wearer ? Us too. You may have seen Peter on the front page of the Surrey Advertiser, or read the article in the Leatherhead Advertiser. We are harvesting unwanted spectacles for Vision Aid Overseas to recycle, so they can fund their Vision Centres in eight African countries. In the newsletter you will also read about next week’s MAIASTRA concert in Cobham, our own lunchtime Song Recital next Thursday by baritone Thomas Humphreys, and this Friday evening’s Skampa String Quartet (from the Czech Republic) playing in St John’s School Chapel. We hope you will enjoy your music-making and your listening! The time is coming round for another article for the above magazine. The closing date is the 9 Sept. 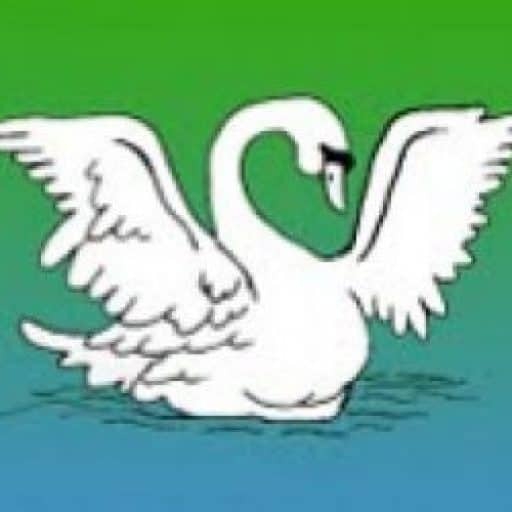 If YOU would like to write an article about something that concerns you in Leatherhead, or something you have seen or heard here, do please compose one and send it to me, the LRA secretary. Although our town and its surrounding district is the common denominator, each person has a different slant on what goes on here and what could be interesting to others. It needs to be between 500 and 550 words. If this takes you by surprise and you are not quite ready now, the next deadline for me to receive something would be the 9 Oct. I can be contacted directly from the Website (under Contacts) or you could put an article in our postbox at the Institute. from Caroline Brown, Sec. to the LRA. My apologies if yours is not the article chosen. It’s also front page news on our website, and we are supporting it via our social media accounts and on our staff intranet. We also have this eye-catching A3 poster, attached. We would really appreciate it if you could help spread this important message by putting some up. I also have some glossy hardcopy versions – do let me know if you would like me to send you some. Also, see the Blog underneath this announcement. It explains what happened at the High Court. The Open Meeing for the Agenda below starts at 6.30, our Speaker starts at 7.30. 2. Minutes of the last Open meeting on 1st July 2013.
i Resignation of Press Officer because of over work. Attendance at the High Court to hear to decision of the Judge on the Cherkley Court Planning Permission. Report from the Fortyfoot Road campaign. 6. Reports from our normal sub-groups – Membership and Publicity, Environment and Planning. 7. Talk by Mr. Kevin Hurley, at 7.30.